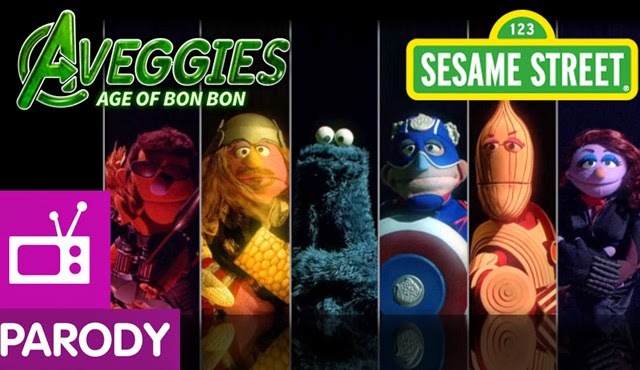 Sesame Street Parodies The AVENGERS: AGE OF ULTRON | Warped Factor - Words in the Key of Geek. No stranger to parodies, Sesame Street take a stab at the number one movie in the world right now, Avengers: Age of Ultron. In The Aveggies: Age of Bon Bon, a super villain is prepared to destroy all the healthy foods in the world, until one hero, actually, several heroes stuck together to save the world's vegetables! Together, Dr. Brownie, Onion Man, Captain Americauliflower, Black Bean Widow, Mighty Corn, and Zuchin-eye are...The Aveggies! Not only is it pretty much brilliant throughout, but it's worth watching if only for two classic moments from Cookie Monster (aka Dr. Brownie). Firstly the line "That me secret. Me always hungry", and then when he questions Zuchin-eye with "What’d you ever do?" Even Sesame Street have no idea what Hawkeye does!